While Sian focusing on provisioning the galley Paul has been doing an inventory of safety equipment, navigation tools, engines and equipment, and, of course, fishing! First up is a review of our safety profile. 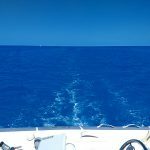 Before I get into specifics I want to say this; it simply does not matter what the quality and the quantity of the safety equipment you have on board if you are attempting to go to sea in an ill-equipped vessel. 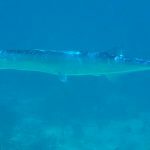 Yes, when the inevitable happens, the equipment will give you a fighting chance at survival, but why spend all of that time and resources on equipment when the biggest piece of equipment, the boat beneath your feet, is not well found? Make sure that the boat you have is the right boat for the journey. 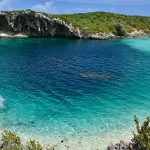 Make sure that the hull is sound, that the through-hulls, fuel lines, and anything in the engine room that may spark, is ship-shape and secure. Make sure that the engines and running gear are well maintained and will get you to and from your destination. And make sure you have fuel in abundance to do the same. Tightly linked to this is to make sure that the captain and crew are also up to the task. Is the experience on board up to the journey, and able to deal with whatever is thrown at them? Help is not always around the corner! First-time crossers should consider a buddy-boat for that first experience. Part of our reparation for this trip is to complete a full day first aid/CPR course with the Red Cross, which we have scheduled for mid-February. We have also updated our first aid kit, as well as doing an inventory of additional things that we are going to add over and above the standard kit. 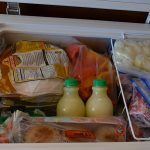 So more medicines such as hydrogen peroxide, any ointment not in the kit, burn spray, aloe vera, Benedryl tablet and cream, heat pads, Aleve or Motrin, cold and decongestants, indigestion, etc. Bottom line, we aren’t going to be able to prepare for everything thrown at us, especially the major medical stuff, but we are going to do our best. One last point. We did consider adding a personal defibrillator. But on researching this we learned some things that we were not aware of – including when you use it. Our thinking was, even though we currently have no heart issues, this would cover heart attacks and other first time heart events. But defibrillators are for regulating hearts, those that go into defib. They are pretty worthless in the event of a heart attack because of the myriad of other causes. so we decided not to get one at this point. That said, here are the safety preparations we have made on Sonas for this trip. The first thing that needs to be checked is our ability to prevent or stop the thing that every boater fears – fire! Sonas has an automatic halon system in the engine room. The certification must be up to date, and on checking it is. This system can also be manually triggered from either helm station, or a location in the aft cockpit. 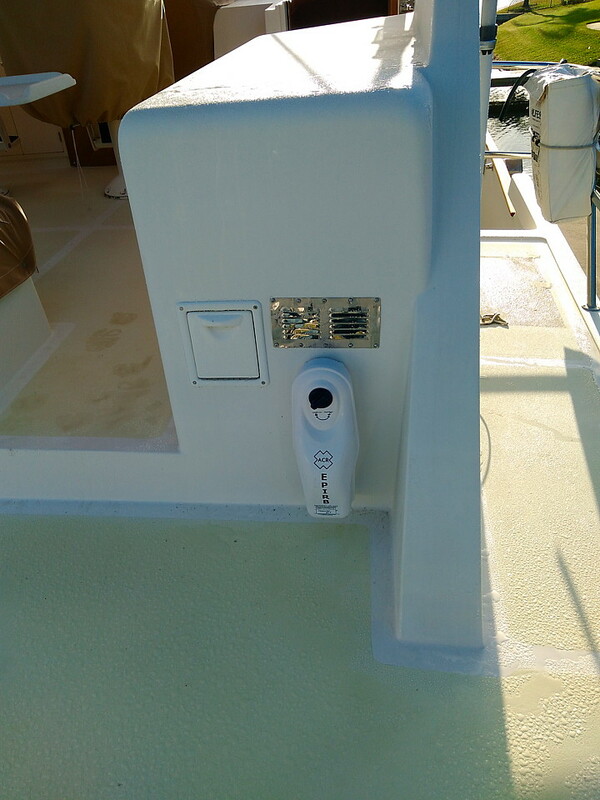 We also need a number of extinguishers throughout the boat should we encounter an issue elsewhere, such as the galley, or in the bow thruster compartment. Every crew member are aware of the locations. Sonas has four additional handheld extinguishers that are capable of handling A, B and C type fires – which are wood/material, liquid, and electrical. 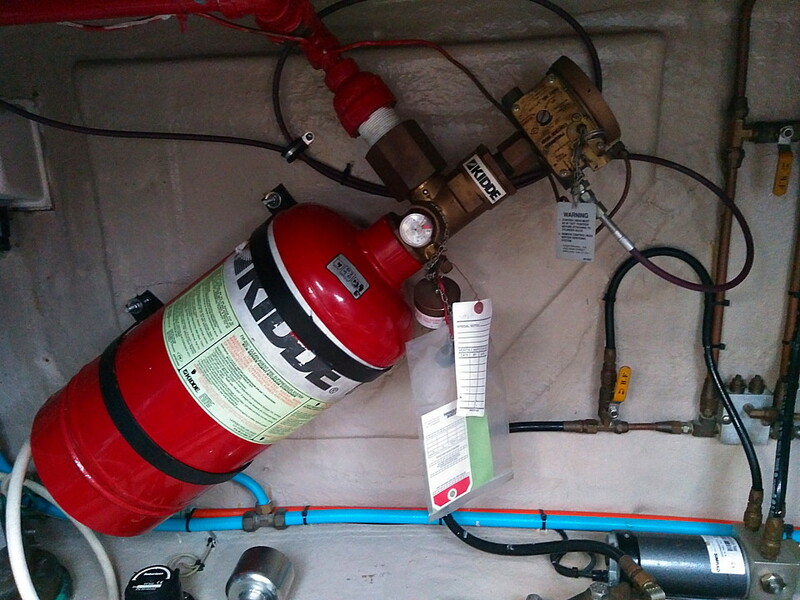 Paul decided to go ahead and add another large handheld extinguisher under the premise that you can’t have too many! The other issue boaters face is a man-overboard, or a sinking/other event that may require us to abandon the vessel. 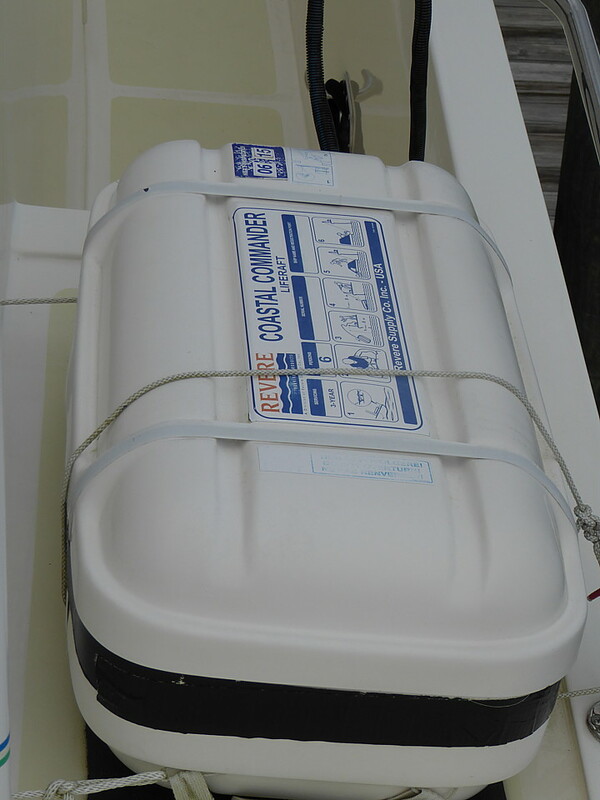 Sonas came equipped with a Revere Coastal Commander six-person life raft. It was past time for it’s five-year recertification so Paul took it along to the Revere facility here in Jacksonville for maintenance and to be recertified. This sits on the side deck, ready to be directly deployed to the water if needed. Another key piece of safety equipment is an Emergency Position Indicating Radio Beacon – or EPIRB. This is used to alert search and rescue services in the event of an emergency. This is achieved by transmitting on the 406 MHz distress frequency via satellite and earth stations to the nearest rescue co-ordination center. The message gives our unique identifier and our precise location. By using the identified the rescue service knows our from a database look up – our names, name of vessel, description of vessel, how many could be on board, what life raft we have, etc. Sonas came with an EPIRB but this too was out of date, meaning that the battery had past it’s dating. While it is possible to replace the battery, Paul decided to acquire a new Category 1 EPIRB for Sonas so that we has a baseline on age and condition. 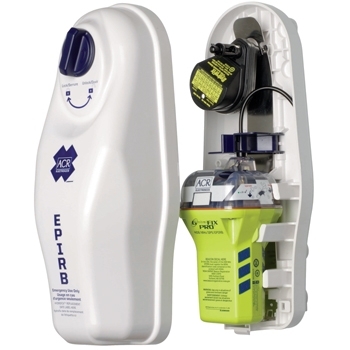 A Category 1 EPIRB is one that is triggered automatically on submersion. The EPIRB is attached to the boat in a location where, when it is activated and needs to float free, it can do so without being caught up by canvas or other equipment. 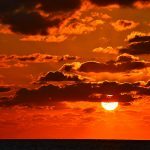 Flares are another important piece of safety equipment and, like many of the others discussed, are a Coast Guard requirement. 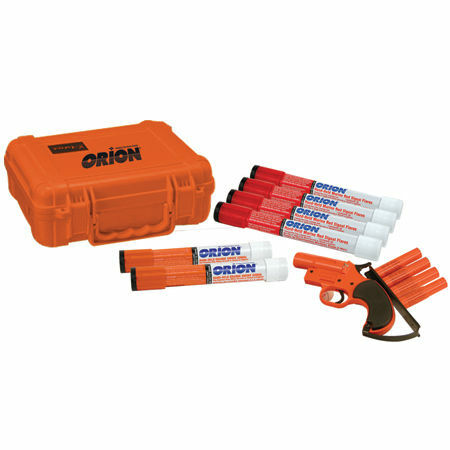 During the past summer we purchased a set of both handheld and pistol fired flares. As many boaters do we also retained the older flares which are out of date, as these too can be used if we run out of the newer flares. Again the flares are kept in a location known to all on board and where they can be easily retrieved and deployed. While in fog or other low-visibility a sound device is critical, as well as knowing the proper way to use it. Sonas has a air-pressure driven dual horn system that is more than up to the task. [RADAR, a good VHF radio, lights fit for the purpose, and solid ground tackle are also important here, but I will cover that in future posts on electronics and equipment]. 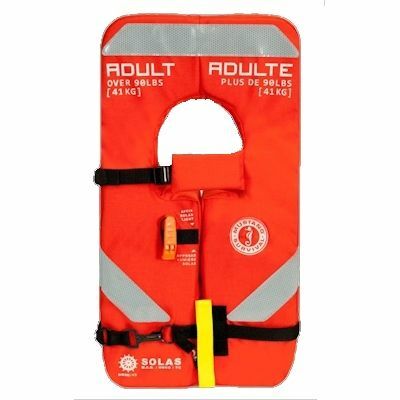 We also need to make sure that we have suitable Personal Flotation Devices (PFDs/life jackets) on board. There needs to be one of the correct size and type for all on board the vessel. Since we are going offshore we need to have Type 1 PFDs for everyone. These bright orange life jackets are designed to turn a person’s face out of the water in the likelihood that they go overboard and may be unconscious. 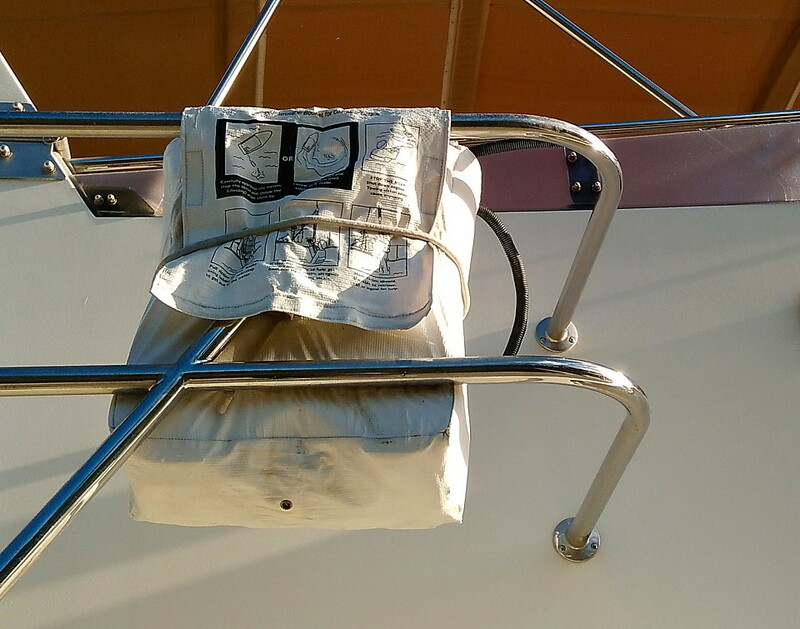 We have eight Type 1 on board under the flybridge seating, clear of anything on top of them. We also have inflatable PFDs on board – these are the automatic PFDs that inflate with CO2 when immersed in water. They may only be used inshore and we will use them when using the dingy to go ashore from Sonas. Finally, we need to make sure that we have a quality “throwable” that can be tossed to anyone who has gone overboard. Sonas is equipped with both a throwable ring and a “horseshoe” recovery strap that is affixed to a side railing. Next up: Navigation; how are we going to get to The Exumas, and what we will use to find our way! Enjoying reading all your preparation. Certainly good to think about all the different possibilities . I am beginning to believe I need a larger boat! In review of your prep, I have begun the inventory of our boat equipment more to status and dates than extent of items. You will need to have your safety briefing up to date for ‘new joiners’, as we said in the mob! The most important part of the briefing is all about what goes into the head, and more importantly, what does NOT go into the head!